Are gifts disinterested presents, challenges geared to rivalry and fighting, offers of social reciprocal recognition, or an exchange of goods on a pure economic base? Sociologists, psychologists, ethnologists and philosophers have discussed these questions for decades, initiated in many cases by the "Essai sur le don" by Marcel Mauss, written in 1924/25 about the form and reason for exchange in archaic societies (Mauss 1968 ). Reciprocity, social totality, anti-utilitarianism and amalgamation of souls and things are the main issues of his ethnographic fundamental and systematic comparative study of the exchange of gifts. Following Moebius, the consequential intense receptions can be substantially divided into two main strands (see Moebius 2010: 70f). On the one hand, there is the anti-utilitarianism mindset (e.g. Bataille and Caillé as representatives of the Collège de Sociologie and the M.A.U.S.S-group and secondly, there is the structural-symbolic branch (e.g. Lévi-Strauss and Bourdieu). While the former idea emphasizes an anti-economic, and unproductive wasteful perception, the latter structure-centered view sees the exchange of goods as a supra-subjective structure, caused unconsciously by the mind with its ability to symbolize and - following Bourdieu - to be thoroughly economic and benefit-oriented. In a different approach Caillé tries to overcome the antagonism of both lines by his so-called "third paradigm" (ibid. : 76). He suggests to avoid the one-dimensional view of holistic vs. individualistic, rationally vs. voluntary, but to speak of the four different cornerstones of human activity, which interact parallel with different intensity. These cornerstones are voluntariness, obligation, interest and altruism. The occurrence of contrasting characteristics as paradox phenomena of the gift is particularly picked up by Marcel Hénaff in a highly regarded approach, directing attention to reciprocal recognition and the creation of a social bond. 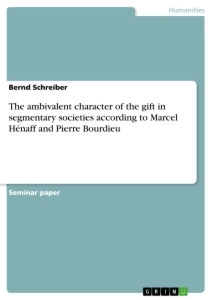 This seminar paper will investigate the ambivalent character of the gift. Between and within the two main strands mentioned, there exists such an argumentative width and depth, that it is essential for the feasibility with reasonable effort to restrict the considerations related to the number of protagonists and aspects. The limitation will refer to two approaches, firstly, Marcel Hénaff and his view of the ceremonial gift and secondly, Pierre Bourdieus understanding of the giving procedure. As starting points and sources of the statements, "Der Preis der Wahrheit" (Hénaff 2009 ) and "Die Gabe der Philosophen" (Hénaff 2014 ) as well as "Entwurf einer Theorie der Praxis" (Bourdieu 2012 ) are used. Both authors are neither pure representatives of the two schools of thought, nor exactly in between. In Chapter 1, the approach of Hénaff is presented, starting with his clarification of the concept of the gift. As a first step it will be shown, how the ceremonial gift is contextual delimited, from what it is not, followed by a brief description of the positive characteristics that define it. The description of Hénaffs main interpretation of the ceremonial gift as a reciprocal recognition with the aim of knotting a mutual social bond ends the chapter. Chapter 2 describes the approach of Bourdieu. The starting point is the 'dialectic of challenge and response of challenge' deduced from his studies in Kabylia (Algeria)(see Bourdieu: 15ff). As a result of his observations he developed his praxeological approach, in which the concept of habitus and the time difference between gift and counter-gift are key components. From his point of view this leads to the two levels of objective reality and subjective truth. Chapter 3 focuses on the ambivalent view on the gift, in chapter 3.1 according to Hénaff, and in chapter 3.2 according to Bourdieu. Finally, the results will be summarized and appraised. Marcel Hénaff is a French philosopher and anthropologist who has suggested a new approach to the enigma of the ceremonial gift. Before going into the ceremonial gift exchange itself, in order to avoid interpretation errors, it is necessary to clarify the gift concept in more detail. In chapter 1.1 the modes of the gift are divided into three categories. Afterwards, in chapter 1.2 the delimiting and in chapter 1.3 the characterizing criteria of the ceremonial gift are described and finally, chapter 1.4 is an attempt to summarize purpose and interpretation from the view of Hénaff. Hénaff thinks that the undifferentiated use of the term gift is a fundamental mistake: "...die Hauptursache der falschen Debatten daher rührt, dass völlig verschiedenen Gabeformen eine gleichförmige Behandlung zuteil wird - ein epistemologischer Fehler, dessen Konsequenzen für weite Teile der Sozialphilosophie und der Anthropologie schwerwiegender sein dürften, als man glaubte" (Hénaff 2014 : 58f). In order to resolve it, he suggests to distinguish between three types: a ceremonial, a charitable or selfless and a showing solidarity kind of gift (see ibid. : 59ff). The first one, the ceremonial gift is public, ritual and reciprocal. By contrast, the charitable or altruistic gift is usually unilateral, private (or public) and it is marked by psychological and moral triggers of generous, joyful and spontaneous giving. The third form of gift giving is showing solidarity, generous and often unilateral, performed to close friends (e.g. neighborhood assistance) or strangers (e.g. event of disaster), what means that in these cases giving is more a helping than a giving fact. The goods are accordingly neither luxury nor prestige objects, but adequate useful things needed in this situation of help or misery. However, the shares can be immaterial, e.g. advice and showing solidarity gestures. For a further delineation of what the ceremonial exchange is not, Hénaff emphasizes that it is neither of economical nor moral nor juridical nature (see ibid. : 56ff). The non-economic nature is particularly evident in the highly-regarded Kula-ring on the Trobriand Islands, where precious bracelets and necklaces are exchanged between the inhabitants of many different islands. While this is a profitless giving and replying of gifts, there exists parallel and independently the so-called gimwali, a pure barter where actors trade and haggle in a profit-oriented way (see Malinowski 2014 : 199). At gimwali useful goods are exchanged, whereas within the ritual gift procedure symbols with commitment character are exchanged. Thus, Hénaff agrees with the anti-utilitarianism line that the gift is not of economical nature, but is on the contrary to the M.A.U.S.S.-group or the Collège de Sociologie neither an alternative nor the contrary nor a harbinger of (modern) trade (see Hénaff: 175). Furthermore, the ceremonial gift is not philanthropic or a show of solidarity, so it is not moral. Finally, it is not a legal obligation of whatever sort of contract, because there are no criteria like terms, sanctions, and quantitative assets or liabilities to be found. Uneconomically and unselfishly as the ceremonial gift is supposed to be, it is not a pure or true gift according to Derrida, who demands of such a form that someone "ohne Grund gibt, ohne zu wissen, dass er gibt, und zwar jemandem, der ihm nie etwas schulden würde, da er nicht wüsste, dass man ihm gegeben hat" (Godelier 1999 : 294 note 13). This dividing line between an impossible realizable pure gift exchange and all other kinds of gift seems absurd to Hénaff, it is a gift of nobody: "Eine von jeder Beziehung gereinigte Gabe wird selber zu einer negativen Entität mit unklarem ontologischen Status" (Hénaff 2014 : 256). 8) Giving oneself in the thing given as a pledge of the self. These definitions have no claim to exclusivity, some, e.g. generosity, also occur in the other two forms of gift, but are based there on a different intended purpose, for instance compassion or rejoicing in an enjoyment of others. The thing given in terms of precious objects fulfills a dual functionality, firstly according to 1) and 3) as a visible public gift and secondly, according to 5) and 8) as an offer to the other with the obligation to give something of oneself as a substitute of one's self. The view of the gift as a present is subordinated by Hénaff. For him it is more important to understand the thing given as a third element, that is as a symbolic binder between two actors (groups) who want to join a common pact of reciprocal recognition: "kein Bund ohne Bundeslade" (ibid: 65). Following a theory of norm of exchange, suggested by Peirce, it is this thing given as a third element which is due to the obligatory character of giving and taking according to 5) (see ibid: 67f). Second part of the obligatory character according to 5) affects the reply. Here as well, Hénaff assumes a law that is responsible for the necessity to reply. For him it has the structure of gaming, rivalry or fighting. The one, who is ready to keep to the agreed rules and to play within a limited playtime, has to (re-)act from the start, alternately has to reply player turn after player turn, so not to end up as loser. Hénaff sees this phenomenon of the ceremonial gift exchange as inherent in the natural behavior of humans (see ibid. : 69). Based on the above characteristics, for Hénaff the main purpose of the ceremonial gift is the reciprocal public recognition between groups in segmentary societies, knotting or renewing a social pact or bond. This process begins with the so-called opening gifts. They are a first offer by the donor for recognition, a risk and a challenge with uncertain outcome. It is the starting signal for mutual acting and reacting, a provocation in order to determine in a simple and effective way to what extent the partner or opponent is willing to be seduced by the offer and finally to be tied (see ibid. : 70). Since the other (the other group) cannot not communicate (Watzlawick et al. 1980 : 51), in any case the donor receives a response from the entire spectrum of possibilities from war to the desired social bond (see Hénaff (2014 :122). Directing the attention more on the motivation of giving and the initiative for reciprocal recognition, Hénaff opens another perspective on the phenomenon of the gift that doesn't correspond to the established lines of reception. With the structuralist-symbolic line such as represented by Lévi-Strauss, he shares the logic of reciprocity and of course the symbolic nature of the gift, but differs from him with respect to the agonistic view. For Hénaff the process of gift giving is alternately asymmetric and not a generalized symmetric reciprocity. The reciprocity is not a predetermined fact, but is through presence of the actors. In accordance with Mauss he highlights the issue of the 'donor within the gift, but regrets that Mauss strongly focuses on the reply of the gift rather than just the motivation to initiate the process of giving. In chapter 1, Hénaffs view should be shown that the ceremonial gift exchange - along with the charity and solidarity - is one of three fundamentally different gift forms. The various features have been listed, which describe the ceremonial gift as a method of public reciprocal recognition and a way to forge and maintain a social bond between segmentary groups. The following chapter will discuss Pierre Bourdieus perspective on the gift. Pierre Bourdieu (*1930-†2002) was a French anthropologist, sociologist and philosopher. Following Moebius, Bourdieu is a representative of the structural-symbolic line in the second generation after Mauss (see Moebius 2010: 74). However, he does not represent a pure mechanical structuralist view, but emphasizes the interactions between (subjective) actors derived from practice. To investigate this and to devise a theory of practice is probably founded in his ethnographic documents and fieldwork in Kabylia in Algeria. Starting point for his social and philosophical implications is, as described in Chapter 2.1 the 'dialectic of challenge and response to challenge' observed at the Kabyles behavior. The reason for acting in a certain way is what Bourdieu calls the concept of habitus. This together with the term 'symbolic capital' will be outlined in chapter 2.2, followed by indicating the relevance of the factor 'time' in chapter 2.3. The final chapter 2.4. describes the generalization of his results in the form of his praxeological realization, which tries to overcome the antagonistic points of view between objectivism and subjectivism. subsequently 'segmentary' is used instead of 'archaic', traditional', or 'primitive'. M.A.U.S.S. = Mouvement Anti-Utilitariste dans les sciences Sociales. subsequently (Hénaff:..) = (Hénaff 2009 :..). subsequently (Bourdieu:..) = (Bourdieu 2012 :..). this issue is further investigated in chapter 3. War Propaganda between Ambivalent Idealism and Existential Pessimism. A Study in Owen's "Futility" and Brooke's "The Soldier"